Includes a free preview of future issues in the collection Presid. Silver Dollar Trials . For more information, please refer to the Satisfaction Guarantee tab below. If you do not wish to preview future issues in the collection, you may purchase the single item using the 'Individual Item Only' tab at right. One of the Founding Fathers, George Washington served as Commander-in-Chief of the Continental Army during the Revolutionary War and was elected to be the first president of the United States of America in 1789. He is credited with establishing many of the rituals still used in the White House today, including the use of a Cabinet and delivering an inaugural address. Washington has become a central figure in the birth of our nation, synonymous with American patriotism and leadership. 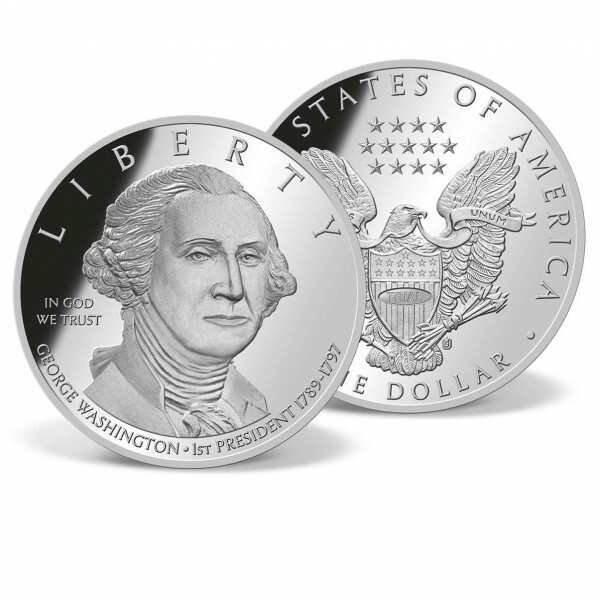 This exclusive collection, plated in .999 pure silver, is our artists' interpretation of what thenext U.S. silver dollar coins would look like if they were to feature the portraits of all our past Presidents of the United States.